The rear view of the table shows the back facing, which I added to conceal the edge of the plywood platform and to prevent loose items on the table from rolling off. The ends of the side supports were resawn after being assembled to create a smooth edge, then sanded, stained and varnished. My wife wanted a table that she could set her laptop computer on and use comfortably while in bed. This is what I came up with. 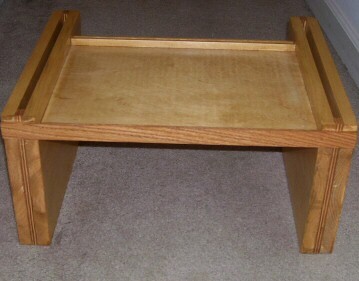 It is made of 3/4″ wood for the sides, 1/2″ plywood for the central platform, and 1/4″ oak for the facing and tray edges. The central platform fits within dadoes cut into both sides and then glued into place. 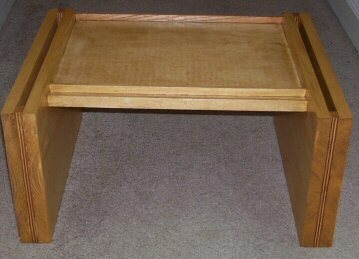 The gaps on each side are to hold documents and reference materials, and the tray in the front holds pencils. 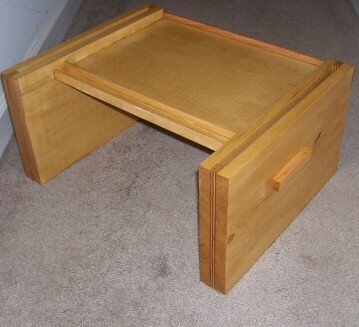 This is a table I made for my wife so she could use her laptop computer comfortably while in bed. It elevates the laptop about 11″ above the bed and is made of 3/4″ wood and 1/2″ plywood, then stained and varnished. Oak wood 1/4″ thick make up the facings and tray edges. The gaps on each side are solid on the bottom to hold documents and folders, and the tray in front holds pencils. My wife wanted a small table to set her laptop computer on and use more comfortably while in bed. After some measurements, I came up with a lightweight table that looks nice and is very stable. 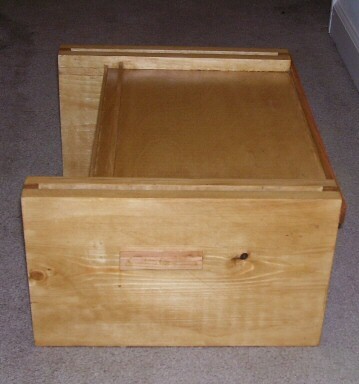 I used 3/4″ birch with 1/2″ spacers on each side to create gaps to hold documents and papers, and 1/2″ high quality oak plywood for the central computer platform. The plywood is set within dadoes cut into each side and glued in place. The rest of the dado was then filled in with wooden inserts. For edging I used 1/4″ oak to create trays and borders on the platform, and added small 3″ long wooden handles on each side to make it easier to move.